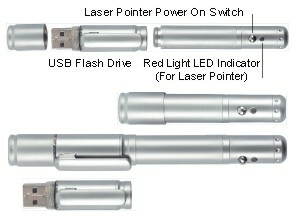 RLD256 -- Red laser pointer and USB flash drive with 256 MB memory. The pointer takes only one AAA battery. The USB drive can be separated from the pointer. The rest become a shorter pointer as shown in the photo above. Packed in a tin box with one AAA battery and a retractable USB cable.